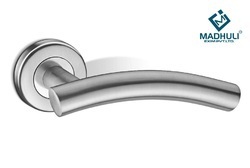 Smartly designed stainless steel lever handles allure the heart of viewers with slim body and smooth touch. The handles are heavy sprung to ensure long lasting performance in high traffic areas. 'L' Shape Tubular Mortise Lever Handle for Narrow Style Doors. With Oval rosettes and escutcheon.